The control relay is an electronic device which can be used to detect and monitor physical values or electrical values. If a device is found to be operating abnormally, the control relay trips to halt its operation. The control relay is used to protect machines by monitoring values such as current, voltage, phase presence and sequence, levels, etc. 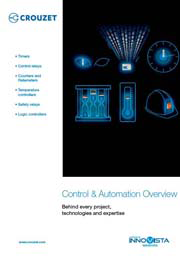 The control relay ensures total availability of equipment, a major challenge for industries keen to improve their productivity and operating profits. It is one of the indispensable monitoring components for ensuring continuity of service of each installation. If a fault is detected, the machine is not allowed to run and the user is informed of the anomaly by a visual signal. Thus alerted, the user can then correct any malfunctions. This avoids expensive breakdowns, synonymous with production delays and loss of profitability. In level control, the control relay takes on a different role: it controls the pump in order to manage the level of water in a container (tank, swimming pool, sink, etc). Directly interfacing with probes, it triggers a signal and thus safeguards against machine breakdowns due to threshold adjustment. Positive logic output to protect installations in the event of a power failure. True RMS guaranteed regardless of interference on the electrical supply. Better integration in industrial and commercial cabinets thanks to modular casings and industrial casings. Simplified installation thanks to a power supply for single-phase products and a self-powered version for three-phase products. 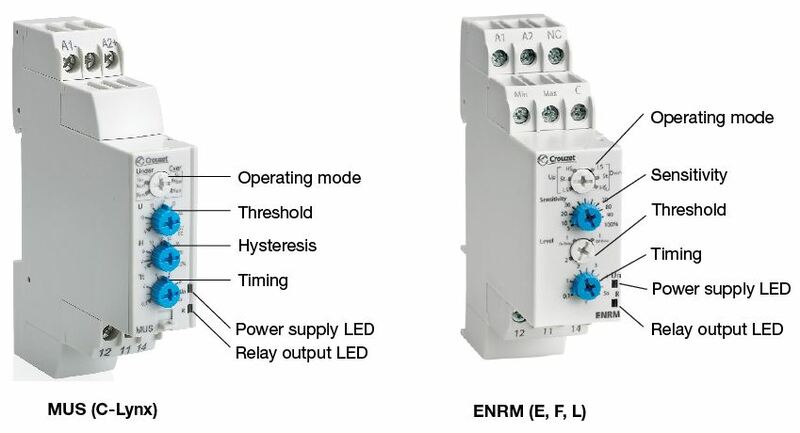 The combination of a number of control functions in one unit optimizes wiring time and simplifies installation. A range of power supplies from 24 to 240 V in one unit for optimized stocks.